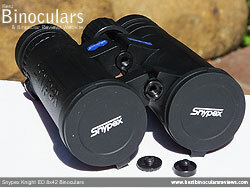 New kids on the block, Snypex Optics recently sent me a wide selection of their Knight ED binoculars to take a look at. The Knight ED's are currently their flagship series, consisting of quality mid and full sized roof prism bins with a whole bunch of quality components and so I thought I would start by testing the most commonly requested and used configuration, the 8x42. Taking a look at their main features and specifications, first impressions are very good as these mid-to-high end optics look to have all the main bases covered and more. Combine this with what looks like a very competitive price point, they look like they will not only appeal to a wide audience, but also bring a big a big smile to their face as well. Snypex have opted to give the straight through roof prism Knight ED's an open bridge body design. This means that instead of having the more traditional single wide hinge connecting the two barrels, these have a couple of thin bridges located at each end of the body. Firstly because they use less material, it can lead to a lighter overall body weight (depending on what the hinges are made from), but more importantly this shape leaves much more of each barrel completely exposed for you to hold onto and thus makes for a much better shape to hold onto, especially if you are carrying them about using only one hand. Other than the lenses, small parts of the eyepiece housing, the diopter adjustment ring, the eyelets for attaching the neck strap to and small parts of the hinges, the entire external surface is covered in a tough, hard rubber armouring. This rubber is fairly think, but is also quite hard, which will make it more durable and resistant to marking. But it also means it has a slightly less grippy surface than if it was made from a softer rubber and possibly offers a little less impact protection. Snypex Optics however have imprinted their logo on the side of each barrel as well as a fine texture over almost all the rubber, which helps to improve the grip. This also has the effect of making the surface far less reflective than smooth rubber or exposed metal, which if you are trying to remain hidden from people or indeed wildlife can be important. Most current bins have some sort of thumb and even finger indents moulded into the body armour. If these are placed well, they can help a little ergonomically. 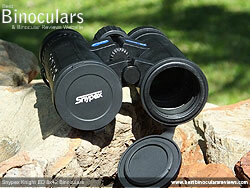 However, these Snypex binoculars do not have with any. Whilst this is in no way a deal breaker, it is just a small observation and something to keep in mind. Like most full sized roof prism binos, these can be fixed to a tripod, quite simply by using a tripod adapter. What is rather unique about these however is that you can remove the cover on both the front and the back hinge to reveal the thread to screw the adapter into. You can only remove the front one or quite often neither on many bridge bins. Whilst not set quite as deeply back as some, at about 6mm, the lenses still get some protection from scratching as well as helps to keep the lenses clear to prevent dust and light rain falling onto them. Snypex Optics advertise that their chassis and barrels are made from a combination of Aluminum and Magnesium, both of which are considered superior to the polycarbonate bodies found on many bins. The body on the Snypex 8x42 Knight ED has been fully sealed and has been submerge tested in water for 15 minutes at a depth of 1 meter. Also remember that this sealing not only prevents moisture from getting inside the instrument but also small particle like dust which can be important especially in dry regions. During the sealing process, they also replace all the internal air with nitrogen, this dry internal environment prevents the inside lens surfaces from fogging up and also helps to prevent any internal corrosion from taking place, extending the life of the instrument. These Snypex Knight ED's use the twist-up eyecup design which is good as it is usually far superior and longer lasting than those that just have a roll up and down rubber cup. The eyecup casing is also made from metal which is great as it is far more robust and works much better than the plastic ones that are usually found on lower cost bins, but also sometimes within this price bracket. On the pair I was testing, the twist-up and down mechanism worked really smoothly without any unwanted play or movement. You also get an excellent 18.4mm of eye-relief as well as two intermediate fixed stops between the eyecup being fully retracted and fully extended on the 8x42 Knight ED. This means that almost all eyeglass wearers easily have enough distance and the flexibility to play with in order to keep their glasses on and still achieve the correct distance between their eyes and the ocular lenses and still get a full view without any dark rings on the edges. The ends of the metal eyecup housing is covered in a thin and hard rubber coating, which does not make them the most comfortable I have ever used, but their large diameter (44mm) does help in this regard and to be honest I never had an issue with comfort even when using them for long periods of time. To adjust the focus from near to far on the 8x42 Snypex Knight ED takes one and three quarter turns of the focus wheel (approx 630°). This is a little more than what I commonly find and whilst this means it takes you a bit longer to change focus over large distances, it does make the small adjustments to your focus easier and more accurate. Considering that components like the eyecup housing and the main chassis is made from metal, I was a little disappointed to see that the focus wheel was made from plastic. However having said that, the mechanism was nice and smooth with just the right amount of friction. There was also no unwanted free play or movement that you can sometimes get. The wheel also has a ridged rubber coating and this along it's reasonably large diameter (30mm), meant that it was easy to reach and accurately adjust, even whilst wearing gloves. 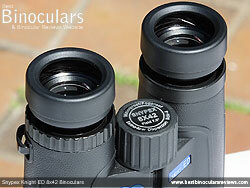 As with on most bins, the diopter adjustment wheel is located on the right eyepiece. This wheel is used to correctly set up the binoculars for your particular eyesight as it allows you to compensate for any differences in the vision of your left and right eyes. 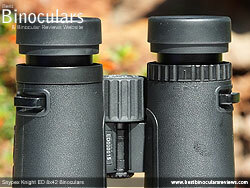 For more take a look at this section on how to calibrate & focus your binoculars. On these Knight ED's the diopter ring looks to be made from metal, this is good and as you turn it there are very fine click stops which is great. On the pair I was testing, it was however probably a little bit too tight and difficult to move, although as you only rally need to do this once it is not a big deal and it will mean that the chances of it being moved by accident are very small. Weighing in at 26.8ozs (760g) these are not the lightest, nor the heaviest 42mm bins out there, in fact they sit around mid table (see below), especially when compared to higher quality binoculars. 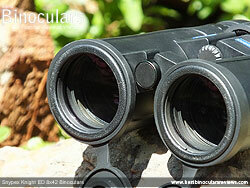 I emphasise higher quality because it is quite common for a cheap binocular to also be very light weight. This is due to them being constructed out of lighter, but substandard materials like plastic. In contrast these and most other more expensive bins will use materials like magnesium and aluminium for the chassis and will have many other parts made out of metal like the diopter ring and eyepiece housings. Vanguard 8x42 Spirit ED 22.6oz (641g) 5.7in (14.5cm) 4.9in (12.4cm) ? Vortex Viper 8x42 HD 24.2oz (686g) 5.8in (14.7cm) 5.3in (13.5cm) ? 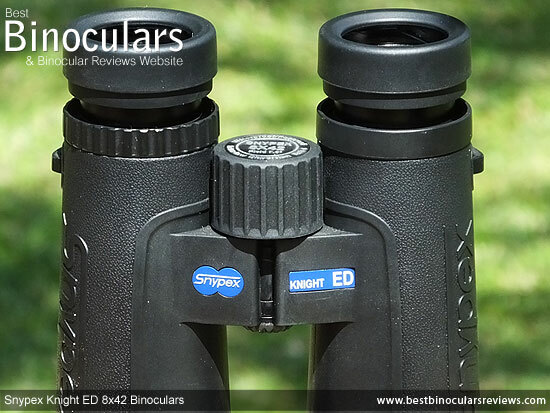 Eagle Optics ED Ranger 8x42 27.4oz (777g) 6.7in (17cm) 5.0in (12.7cm) ? As you can also see in the table above, compared to other full sized 42mm roof bins, their advertised width and height is fairly normal and about average. However their length ranks with some of the shortest, which is noticeable even when looking at them and does make them feel fairly compact for a 42mm bin. The advertised height of 5.1cm (2in) is taken with the hinges fully open and the objective lens covers removed. Adding the covers increase their height to 6cm (2.4in) and closing the hinge raises the height even more to 6.9cm (2.7in). Similarly their width of 12.2cm (5.2in) is taken when the central hinges are fully open, this reduces down to 10.5cm (4.1in) when you close them. The official length of 14cm (5.5in) is achieved with the eyecups twisted in, but the objective lens caps still on. Taking these off reduces their length to only 13.6cm (5.4in), whilst it extends to an absolute maximum of 15.4cm (6.1in) with both the objective and ocular lens covers on and the eyecups fully twisted out. By opening and closing the hinges, you can change the Inter-Pupillary Distance on these Snypex binoculars in order for you to line up the ocular lenses to match the space between your eyes. With the hinge fully open they have a maximum IPD of 7.9cm which is wide compared to most others I have tested and well above what the distance of the average person and so these would suite those with larger faces and wide set eyes. Fully closed, these have a minimum IPD of 5.9cm, which is about average on this size of bin and should be able to accommodate all but those with very narrow eyes or small faces. 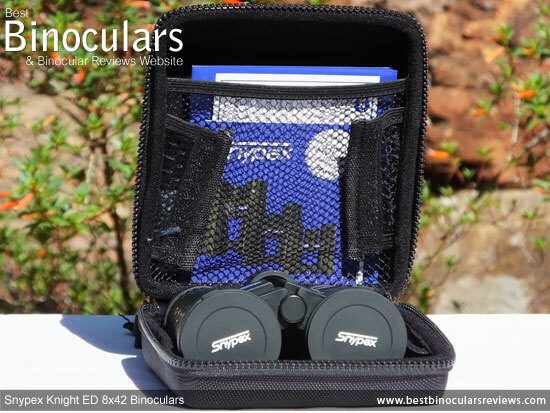 Other than to state that the ocular lenses have a diameter of 22mm (which based on my experience is quite large for a 42mm binocular), I cannot say much more as I was not able to get any more information regarding them. Most binoculars, even very good ones use achromat lenses which usually consist of two lens elements (a concave and convex lens), which can bring two wavelengths of light (usually red & blue) into focus in the same plane. However an APO lens, which commonly has three lens elements and so can bring three different wavelengths of light (most often red, green & blue) to a common focus. Therefore a well designed APO lens can better correct chromatic aberration that causes colour fringing as well as spherical aberration than what an achromat lenses can. However APO lenses are technically difficult to make and costly to produce and so that is why they are not more commonly used. You can read more on this in my complete guide to APO (apochromatic) lenses. 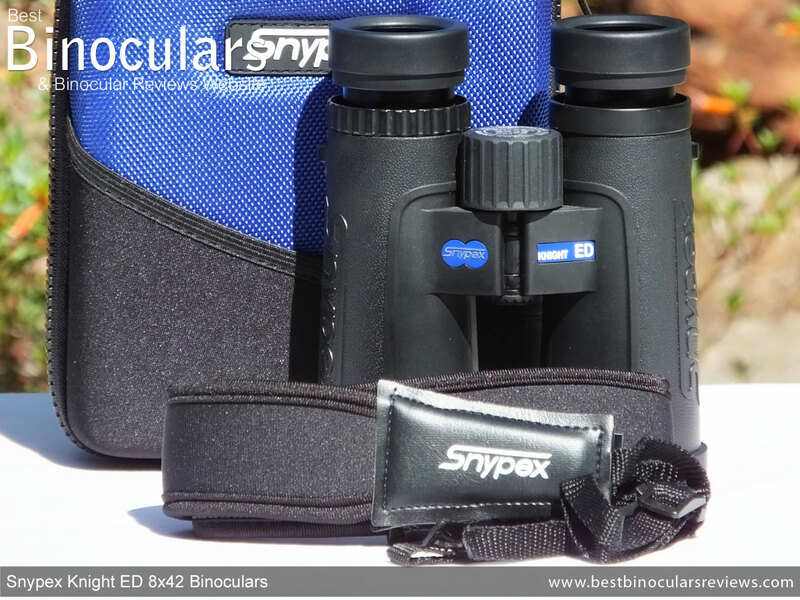 One of the lens elements in each of the APO lenses on these Snypex Knight ED binoculars is made from a glass that has extra low dispersion properties. What this ED glass element effectively does is to give designer of the lens more options to better control the wavelengths of light as they split up when passing through the lens. Thus if designed well they can direct the wavelengths better to combine back together at the exact same point to further improve or even eliminate chromatic aberration, so that you get an image with very little or even no color fringing at all. 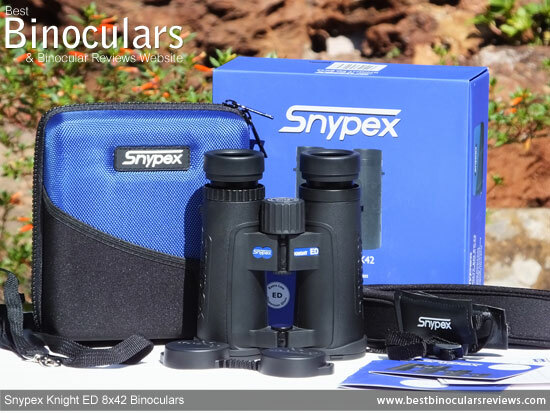 All Snypex Knight ED binoculars, including this 8x42 model use Roof (Dach) prisms to rectify the image which are made from good quality BaK-4 glass. In most bins, this glass is considered to be better than the cheaper BK7 glass. Some of the light that hits and then goes through each lens is reflected, either on the front (incident light) and/or on the rear (exiting light) lens surfaces. This unwanted reflection can cause ghosting and flare and also reduces the total amount of light that passes through the lens, thus the image will appear darker, with less contrast. To reduce this unwanted reflection anti-reflective coating(s) are applied. 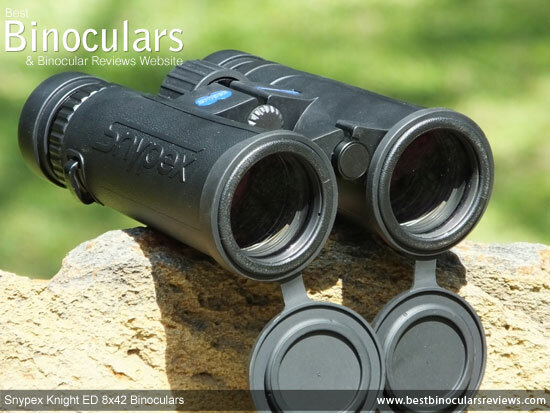 Snypex Optics state that the lenses on these Kite Ibis ED binoculars have been "Fully Multi-Coated", which is great as it means that all the external lens surfaces throughout the whole binocular have had multiple layers of anti-reflective coatings applied to them. The exact wording when describing these coatings is really important to take note of as to save costs, some bins only have some of the lens surfaces coated (multi-coated) and worse still as some that only have a single coat applied to some surfaces (coated). These fewer and lower quality coatings mean that some may only transmit about 66% to 86% of the light that arrives at the lens. Whilst FMC binos like these will have a transmittance of between 90% to 95%. In my experience of all the coatings, these makes the biggest transformation and you really can notice the difference in brightness and overall quality of the image on those that are fully multi-coated. Even on a perfectly processed Dach prism, one surface can cause a phenomenon known as phase shift that negatively affects image resolution. To correct this, higher quality bins like these 8x42 Knight ED's have phase-correction coatings applied to the surface, which minimizes the loss of resolution and thus ensures better quality and higher contrasting images. Because the roof prism does not reflect all the light on one surface, better quality optics have this surface coated with a highly reflective material. The cheapest method is to use an aluminium coating, however these use the much better silver mirror coatings that transmit more light. I must point out however that you can also get dielectric coatings, these offer the best transmittance levels, but are technically difficult to apply and cost a lot of money, which is why they are usually reserved for the very top end bins. These 8x42 Knight ED's deliver a view that is 393ft wide at a distance of 1000 yards away (131m wide at 1000m), or to describe it another way, the angle of view is 7.5°. Snypex Optics state that the minimum close focus distance of these 8x42 Knight ED's is 2m (6.65ft), which on BBR is rated as very good (excellent is anything under 6ft). However on the pair I was testing, I measured the close focus to an even nearer distance of only 1.64m (5.4ft). with 18.4mm of eye-relief, these just make it onto the BBR list of long eye-relief binoculars, and thus I would recommend these to those who wear glasses and who are after a premium 8x42 binocular. When judging the view on any bin I am reviewing, I compare different aspects of what I see through them with that of a number of similar controls that I have. This way I am able to be more constant with my observations and be able to place and rank them in relation to others I have tested in the past. The brightness of the image that you see or perceive is affected by the quality of the optics and their coatings, but it also has a lot to do with how much light is gathered and the diameter of the shaft of light that is directed onto your eyes. When the light is good, most 8x42 binoculars will deliver more than enough light to your eyes and thus it is not surprising that as I observed with these, the image brightness looks the same as that of my controls. However in poor light, I was able to detect a small improvement with these compared to my mid range controls and they matched my high end 8x42 controls and so would rate them as very good to excellent. For more read my guide to the exit pupil and image brightness. The view through the Snypex 8x42 Knight ED binoculars that I tested looked bright, but very natural, with a good amount of contrast. There were no artificial tints that I sometimes see, especially on cheaper bins that use lower quality prisms or which have coatings like the ruby on the lenses, that try and hide some other shortcomings that they may have. Focusing on an object 5 meters away, I take the view back without altering the focus wheel until it is no longer in focus. I compared this distance with that of my controls and found it to be about the same and so their depth of field is about the same as most other 8x42's. When looking at an object that contrasts greatly with it's background, you can sometimes see a ring or rings of color around the edge of the object. This is known as color fringing and is caused by chromatic aberrations. Better optics use a variety of methods to reduce or even totally get rid of this fringing. Because of the Apochromatic lens design and the use of ED glass in the lenses (see optics section above) I was expecting the Knight ED to perform very well in this area and they did not disappoint. Whilst not completely eliminated, I had to take it to the extreme by viewing an object with the sun in the background (being careful not to look at the sun) and then look very, very hard to notice a tiny amount of fringing - in this case a very thin red line. During normal use, you would never notice this and so these rank up there with the best that I have looked through. 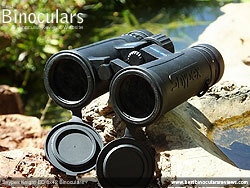 The amount of fuzziness that you get right at the edge of the view on these Snypex binoculars is very small. It is not quite as little as the best that I seen, but still very good. These Snypex Knight ED binoculars come with an excellent rigid case (box) that in terms of the materials used and the build quality is up there with the best that I have seen. The fact that it is fairly rigid, it will protect your optics from crushing much better than most others that use soft cases. To get inside it, there is a zip that runs right around most the case and there are two fasteners meaning that you can choose to open it from any point along the zipper. The long length of the zip also means that the case can be opened right up to gain easy access to the bins inside. However to prevent them from always falling fully open, which could be a pain especially when out in the field where perhaps your bins could fall out, they have a piece of mesh sewn into each side, each of which has a strip of Velcro sewn onto it, these can be fastened together which then prevents the lid from opening all the way, but still leaves enough room for you to access your bins. This is not something that I have ever seen before and is a nice tough, showing a good attention to detail. Whilst the interior is far less padded than on most soft cases, I think considering that this is a rigid container there is enough to adequately protect the optics inside. The Knight ED 8x42's fit snugly inside which is good as it prevents them from moving about. What is also great to see is that Snypex Optics have left just enough room for you to just be able to store the bins with the eyecups twisted out and even with the hinges closed there is just enough room to close the zipper. Meaning that you don't have to reset your IPD every time you return them to the case. Inside there is also an elasticated pocket as well as another tighter fitting one on the outside. Both are great for storing your lens cloth and a few other smaller items. I like the carry strap that comes with the case even though it is very simple and un-padded, it works well and is small enough not to get in the way. It can either attach to a metal loop located on the rear of the case or to the Zip fasteners via a quick release latch made from metal that also has a swivel on it to prevent the strap from getting all twisted. You can also thread this latch through both Zip fasteners (like you do with a lock on a suitcase), which will prevent the Zips from separating and thus keeps the case closed. On the rear of the case there is also a loop that enables you can use to thread your belt through should you wish to carry it on your hip. Whilst the included neck strap works well, is comfortable and is more than adequate, I have to say that it does not match the quality of the carry case or indeed the binoculars themselves, which is a little bit of a shame. The padded section of the strap is slightly curved so that it fits over your shoulders and around your neck a little better. It is 4.2cm wide and you get about 6mm of soft padding that is more than enough to make carrying the bins around your neck very comfortable, even over long periods of time. It fixes to your optics in the usual way by threading the ends of it through a couple of eyelets located on each side the body and then back on itself and through a slider. The connection between the thin nylon straps and the padded section is achieved with a faux leather section that is sewn onto the two different parts of the strap. While this works ok, better straps have a looped connector that allows for a little more free movement, meaning that the padded section does not move as you transfer the bins from hanging in front of your chest up to your eyes. Fashioned out of a soft and flexible rubber, the tethered objective lens covers are fixed to the body of the bins using a simple rubber loop that goes around the barrels. I really like this method as it is simple, yet effective and if you don't like having the covers dangling below your optics whilst you are glassing, it is simple enough to completely remove them. I also like that the covers themselves fit into the ends of the barrels as opposed to over them as is the case on most as this just looks a lot cleaner. The ones that I tested fitted well and should not come away too easily by accident. Also made from a soft rubber the rain-guard protects the ocular lenses and the eyecups. The ones supplied with the Knight ED fitted well and I like the very flexible connector between the two cups that allows them to fit no matter how far you have set the distance between the eyecups at (IPD). The guard also has a loop on each side so you can thread it onto the neck strap. One of these loops is split so that you can quickly add and remove it from one side of the neck strap when you are glassing. The supplied lens cleaning cloth that comes with these Snypex Knight ED 8x42 binoculars is of a good quality and will be fine for light use out in the field. But for a thorough clean I still recommend that you invest in a specialist lens cleaning kit that will not only make it easier to clean your lenses, but ensure you don't scratch or damage the glass or it's coatings. 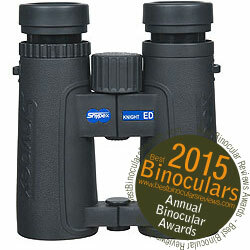 Snypex Optics offer a 5 year limited warranty on all the Knight Series ED binoculars. Full information and the registration warranty card is included in the box. Also inside the box is a small instruction booklet that includes basic details on subjects like how to adjust the distance between your eyes (IPD), the diopter adjustment, changing the focus and how to care for the bins. 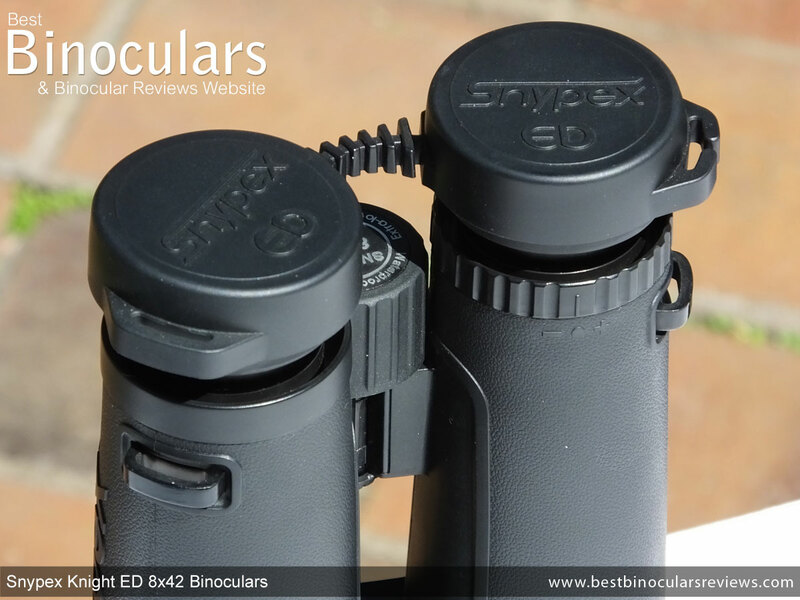 Strong Points: The overall build quality is excellent and Snypex Optics have used very good quality materials in the construction of the chassis, body components and armour which translates to a tough, reasonably lightweight and compact 42mm binocular. 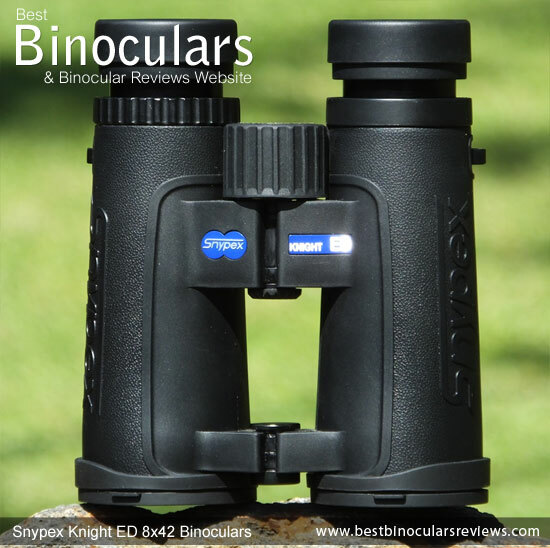 This body then protects some great quality optical components, the Snypex Knight ED 8x42 binoculars have within them some excellent quality lenses and prisms, covered with some top spec coatings. This good all-round quality then delivers a very high quality image that is both bright and natural looking, with almost no color fringing and only very minimal amounts of softening right at the edge of the view. Their field of view is very good, which will please most, but especially bird watchers, wildlife observers and hunters. Whilst different to the normal soft cases, the quality of the included hard carry case is excellent and I feel it not only looks great, but also works very well. Weak points? Whilst there are no major weak points that would prevent my from buying or recommending these, the are a few areas where I feel Snypex Optics could improve the 8x42 Knight ED. The silver coating on the prism is very good, however even better would have been Dielectric coatings, but to be fair not many bins in this price range have this so perhaps I am asking to much? It is excellent that they have a metal eye-piece housings and eyecups, that is why I was a little disappointed to see that they have used a plastic focus wheel. Whilst this works quite fine, a metal one would have added just that bit more class to the product. Likewise the hard carry case is excellent, whilst I would describe the neck-strap as functional but just lacks a little luxuriousness that would just bring it up a level. 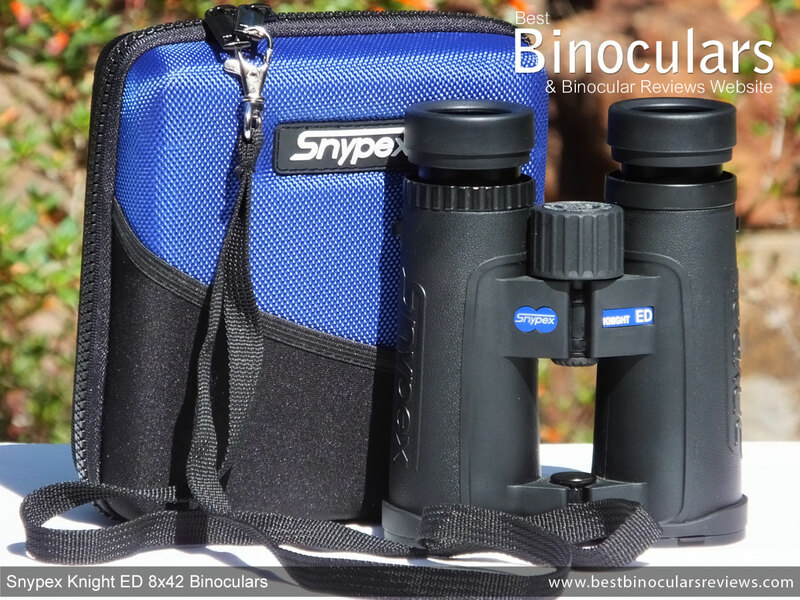 Overall - Keeping in mind their mid-high value price point, the Snypex 8x42 Knight ED binocular is in my opinion a very good buy. They perform as well in almost all areas as any other binocular in this class and even compete with many that cost much more. 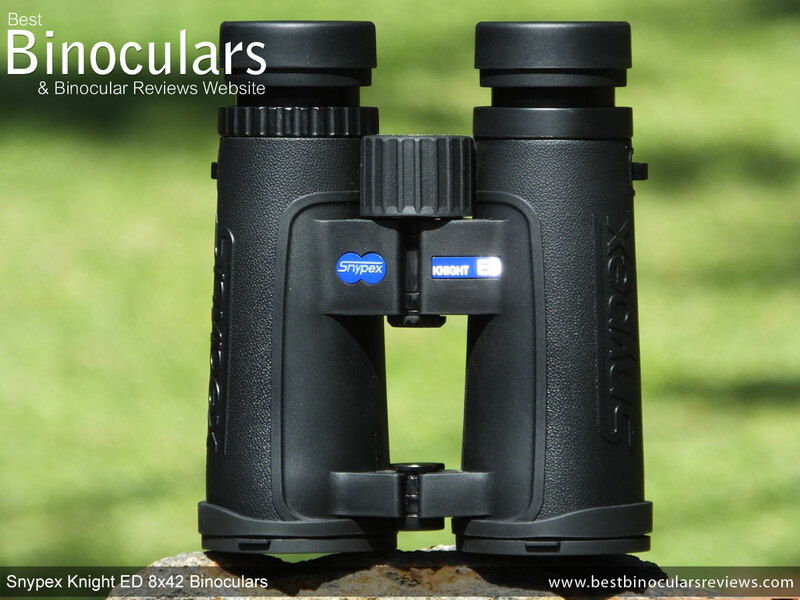 Ideal Uses: Their very wide field of view, fantastic quality image and very good low light performance make the Snypex Knight ED 8x42 binoculars ideal for most bird watching and wildlife observation uses. Combine these attributes with their tough and durable exterior and waterproof body and you have what for most people will be a very good hunting binocular. This good all-round performance also means that these make perfect general use binoculars. I would like to thank Snypex Optics for sending these Knight ED's to me to test and review. I would like to point out that like all the others on this site, this Snypex Knight ED 8x42 binocular review is totally my own and honest opinion of the product and I have not been asked or compensated in any way to write it with some sort of bias. I have spent a lot of time researching this instrument and I believe all the facts and specifications to be correct. However I have been know to make the occasional mistake, so please if you spot one, drop me a like to let me know.